Some people might be disgusted to find a rat stuck in their trash can, but when filmmaker Theo Anthony came home one night, he saw it as way to tell a story. Rat Film weaves together stories of rats’ roles in the lives of Baltimore’s residents, as pests, research subjects and pets. Anthony says examining the concept of a rat allowed him to explore an “interesting map of histories” brought together in the city. The film’s winding narrative comes together to reveal truths about the reality of race and class divides in Baltimore. 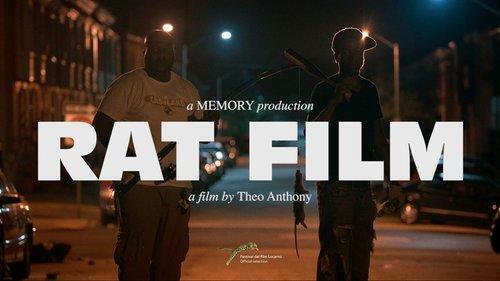 Michaela Tucker spoke with Anthony about Rat Film before its American debut at True/False. Tucker: Where did you get the idea for Rat Film? Anthony: I think specifically with rats, living in Baltimore, they are everywhere and it's a very common thing you see. There’s a shot in the film, it's one of the first shots, it's a rat in a trash can. I came home one night, the rat was stuck in the trash can because it couldn't jump over the edge. It sort evolved from all the things I found in that image. It was a really incredible way to talk about Baltimore and all these different peoples and histories and ideas. Tucker: Why tell the story of race and class in Baltimore and why tell this story through the lens of rats? Anthony: I wanted to know why the city looked the way it did. I used to live on this street Greenmount Avenue that is just so fascinating. On one side you have these multimillion dollar houses that belong to Johns Hopkins' professors, doctors, and lawyers and students and they're from the 19th century and early 20th century, all of these sort of Victorian garden suburb designs. And literally across the street you have abandoned row homes and stuff and it's that sharp of a division. You can stand at one street corner and look to your left and see a totally different tax bracket that's statically supposed to live ten to 15 years longer than the person on the right. And you're like, "why is this sharp division there?" And you realize, when you look into it, it's not accidental. These cities are planned this way according to a very problematic and tragic history that continues today. Rats are very interesting because they cross the street. They don't obey any boundaries. But at the same time, rats aren't happening in those rich areas. And so it's a way of mapping the city, but also of transgressing those very boundaries. Tucker: Throughout the film you weave together a variety of stories of people who interact with rats in different ways. How did you go about finding the subjects and the characters to represent the different sides of rats? Anthony: When my producer first saw the film he had a good comment which was, "This film was like surfing the internet." And I think the way you see the film, my whole process is that I have like 20 or 30 or 40 tabs open on my Google Chrome and I'm just clicking around back and forth. Suddenly I'll see two different tabs line up and I'll save them together and that's really how the film came about. I live in Baltimore, I work here, so I could be reading an article and see a person's name. I'd email them and I'd tell them I'm doing this project about rats and the next day sometimes I'd be on their doorstep with a camera. That's really how the film came about. Tucker: What do you hope audiences take away from the film? Anthony: The takeaway question because it makes it sound like a carryout meal. I totally get the function of the question, that's what people are going for when they see a film, they want a takeaway. People expect catharsis, they expect some sort of solution and all of those expectations are something that I try to push against. Tucker: Why bring Rat Film to True/False?